Gratitude can be a great thing to have in our lives, and one of my favorite ways to do this is in a gratitude journal. Today I am sharing some free gratitude journal prompts you can use in your own journals and art projects – plus a free printable! Creating a Gratitude Journal gives you a way to keep track of all the things you are thankful for in your life. There are many proven benefits to expressing gratitude in our lives. Gratitude can help us feel more relaxed and happy in every day life. It can also be helpful for our health since the practice of keeping a regular journal can reduce our stress and encourage to continue with healthy habits for positive changes in our life. 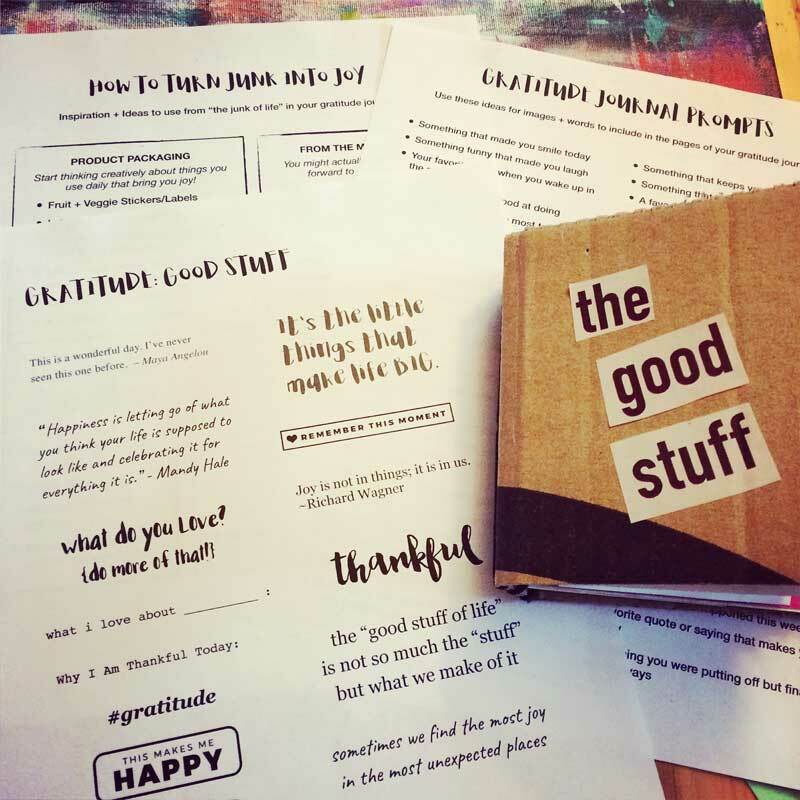 My favorite way to make gratitude journals are with junk journals. These are journals made from the “leftovers of life” – things like ticket stubs, food packaging, and even junk mail. Gratitude is all about expressing your appreciation for things you already have – and so it only naturally makes sense to create a junk journal using materials you already have at home rather than buying something new. 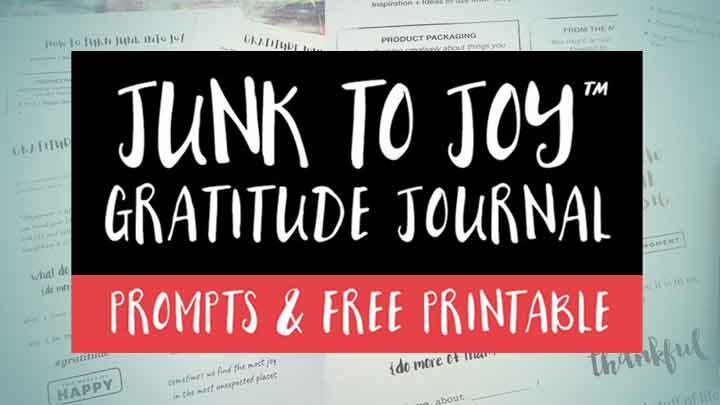 By doing this, we can literally transform the “junk” in our lives into something that brings us joy – which is why I call these “Junk to Joy™” Journals. You don’t have to use a junk journal of course – you certainly can buy a fancy and beautiful notebook, or even get one of our favorite blank mixed media journals. 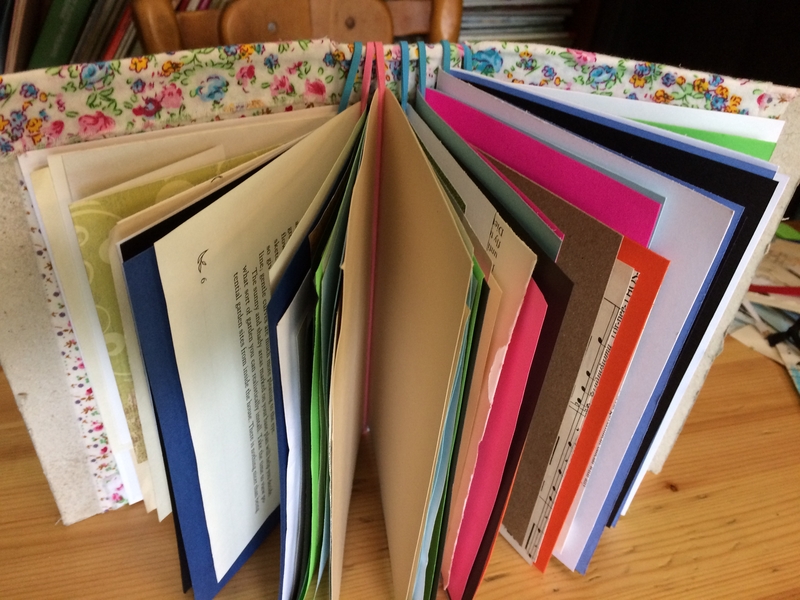 However, there is something uniquely magic and special about making your own books and using materials you already have from around the house. Want to Try Making Your Own Journal? See our tutorials on How to Make a Recycled Blue Jean Journal and The Elusive Perfect No Sew DIY Journal for some ideas and inspiration on how to make your own journals using materials you likely already have at home. Once you have a journal to use as a blank canvas for your gratitude, you can begin filling the pages with anything you would like. The possibilities for ways to express gratitude in your journal are unlimited! The 45 Gratitude Journal Prompts I have listed below are a great start if you are not sure on what types of things to write or put in the journal. Journal prompts are a great jumpstart for creativity to give you some ideas and are the best way to overcome fear and perfectionism in your creative practice. You can use these prompts for ideas for what to write about or use them for ideas on what types of artwork or images to add to you art journal. You can draw, paint or doodle – or you can also look through old books and magazines for images. While you don’t have to add artwork or photos to your gratitude journal, sometimes a visual reminder of the things we are thankful for can be very uplifting to see when you look through book later! 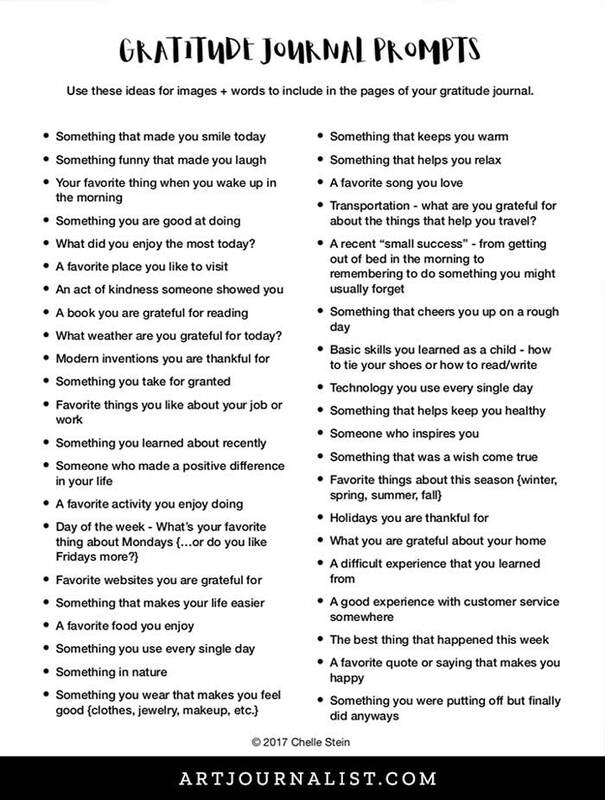 This list will give you all sorts of ideas for what to use as images + words to include in the pages of your gratitude journal! What did you enjoy the most today? What weather are you grateful for today? Day of the week – What’s your favorite thing about Mondays? Fridays? The Weekend? Travel – what are you grateful for about transportation or places you have traveled to? Would you like to print out a list of these prompts for your projects? You may download a copy of these prompts for your own free unlimited personal use. Personal use is for any type of instance where you are not using these cards in a professional environment and do not receive any type of payment or compensation during the time of using these prompts. If you want to use this for professional or commercial use, please contact us here. Questions? Comments? What Are Your Thoughts? 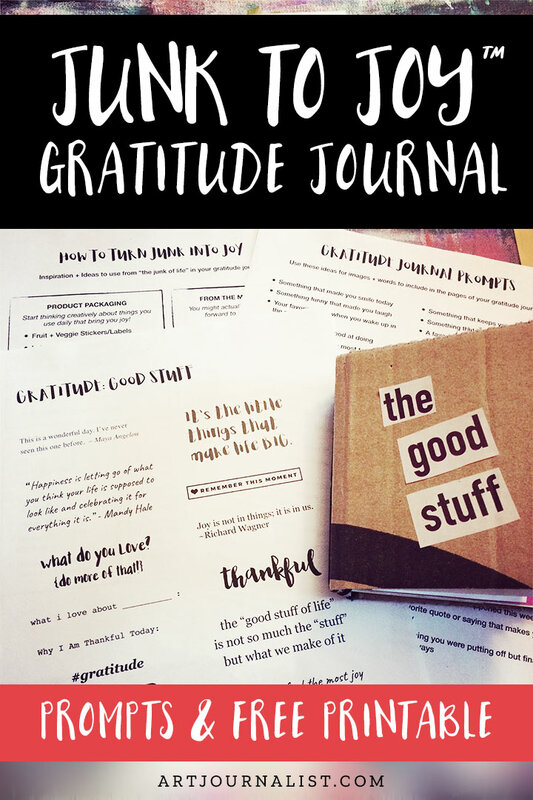 I hope you enjoy these gratitude journal prompts and free printable and that it inspires you to transform all that junk of life into something that brings YOU joy! And if you decide to make anything using these prompts as inspiration you know I would love to see it! Use hashtag #junktojoy on social media or join our Facebook group and share your work there! And of course, if you have any questions feel free to ask in the comments section below – I’m always happy to help answer any questions you may have about making journals! Thank you for this article! I love the printable, too! Thank you Erica, glad you enjoyed it!